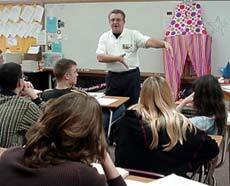 [MARCH 11, 2003] A local man not only informed but also amused Lincoln Community High School students during a recent class session in career education. Joe Hackett talked about jobs in the entertainment field. He told of his experiences as a DJ with his own business, as a talk show host on CITV Channel 5 and (no joking) his performances as a clown as well. Hackett, who is also a retired educator, addressed what kind of schooling is needed for various entertainment-related occupations. The teacher for the class, Judy Radar, said, "The kids just loved him." Student teacher Amanda Denning was in charge of the unit. Hackett's clown suit hangs on the board behind him. [MARCH. 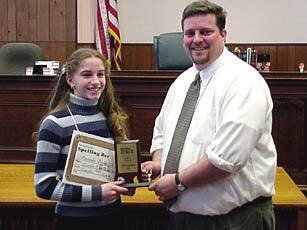 7, 2003] The annual Logan County Spelling Bee was at the Logan County Courthouse on March 6. There were 13 school representatives in this year’s bee, which went 10 rounds and consisted of 69 words. Amanda Podbelsek, daughter of Dan and Ann Podbelsek, won by correctly spelling the word "tribunal." Amanda is in the eighth grade at Zion Lutheran School in Lincoln. Joshua White, a sixth-grade student at Central School, was in second place, and Sam Hageman, a seventh-grader at Mount Pulaski, was third. Mary McKeeth from the Bloomington Public Library was the pronouncer. The Pantagraph representative, Ernie Hamilton, presented the winner with a trophy, and George D. Janet, regional superintendent of schools, presented each of the three top placers with a new dictionary. These three young people will represent Logan County at the Pantagraph Spelling Bee on March 15 in Bloomington. The Regional Office of Education and the Pantagraph sponsor the spelling bee jointly. Ernie Hamilton, presents Amanda Podbelsek with a trophy. [MARCH. 5, 2003] Lincoln College is proud to announce that the following students from the Logan County area have been named on academic honor lists for the fall semester 2002. Students on the Special Honors List include Catherine Bailey, Jessica Bryant, Tiffany Carvalho, Victoria Cooper, Risa Kopp, Ashley Kurtz, Kristofer Langellier, Max Letterly, Josh Long, Angela Maestas, Joshua McMullen, Shannon Merritt, Heather Miller, Shana Reed-Harper, Trudy Shumard, Sallie Snyder, Debra Vincent and Amber Wright, all of Lincoln; Elizabeth Harbin of Mason City; Todd Diebert of Mount Pulaski; and Kyle Peperell of New Holland. Requirements for this honors list are that students achieve a grade-point average of 4.0 with a minimum class load of 15 credit hours for the semester. Area students on the President's List are Angela Couch, Jason Crowe, Kelly Dowling, Matthew Kurtz, Aaron Matson, Dale Miller, Angel Quiles and Stephanie Savery, all of Lincoln; Jennifer Florey of Beason; and Larry Jones Jr. of Hartsburg. The criteria for this list are that students achieve a grade-point average of 3.75 through 3.99 with a class load of at least 15 credit hours for the semester. Area students on the Dean's List are Nathan Buss, Ashley Chinowth, Christinna Dye and Kristien Tabor, all of Atlanta; and Jonathan Ashley, Candy Battin, Ashley Bowen, Micole Caskey, Sara Farkas, Aaron Freesmeier, Terae Frontone, Andrew Frost, Jerry Gossett, Coyne Kaylor, Christina Kennett, Jennifer Knight, Matthew Kodatt, Jessica Shawgo and Tiffany Short, all of Lincoln. For listing in this category, students need to achieve a grade-point average in the range of 3.25 through 3.74 with a minimum class load of 15 credit hours for the semester. [FEB. 25, 2003] Lincoln College has announced the dates of upcoming college visits on the local campus for students who plan to continue their education at a four-year institution. The visits are scheduled from 11 a.m. to 1 p.m. and will be located in the foyer in the Meyer-Evans Student Center. If you would like more information, please contact Jim Bixby, director of counseling and retention, at 732-3155 Ext. 293. [JAN. 24, 2003] SPRINGFIELD -- Girl Scouts, Land of Lincoln Council is announcing college scholarship opportunities to all eligible Girl Scout members within the 6½-county jurisdiction who are continuing their education at an accredited college or university. Girl Scouts attending an accredited college, university or technical school may apply for the Girl Scouts, Land of Lincoln Council Scholarship. This scholarship is a one-year, $1,000 award and is renewable. To qualify, girls must be currently registered with Girl Scouts, Land of Lincoln Council and have been a member with the council for a minimum of three years. Active Girl Scout members enrolling as a junior, senior or graduate student in an accredited college or university are eligible for the Linda S. Culver Scholarship. This scholarship is a one-year, $1,500 award and is renewable. To qualify, girls must be registered members with the Land of Lincoln Council and have been so for a minimum of three years. Girl Scouts enrolling at Springfield College in Illinois also have the opportunity to apply for the Springfield College Girl Scout Scholarship. This scholarship is a $500 award and is renewable. For more information, please contact the college's financial aid office directly at (217) 525-1420. Finally, Senior Girl Scout Gold Award recipients graduating in 2003 are encouraged to apply for the Elks National Foundation Scholarship. This scholarship is a $6,000 award. Information on all Girl Scouts scholarships is available upon request by calling the Girl Scout Service Center, (217) 523-8159, or visiting www.girlscoutsllc.org. The deadline for applications is 5 p.m. Friday, April 11. Please note the Springfield College Girl Scout Scholarship has its own deadline.